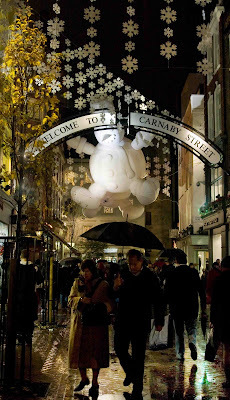 Large inflatible snowmen sway above your head in one of the worlds most famous quarters. Carnaby Street was popularised in the swinging sixties by designers like Mary Quant. Underground music bars like the Roaring Twenties and of course bands - The Beatles, The Small Faces and The Rolling Stones. Oh how I wish I was there to do a little shopping. I do not know how you manage these shots, Mo. This looks amazing. Love the snowman. Was it floating? Ciao. A. Fantastic shot! I will have to check this 'hood out when I'm there (hopefully) next year! I absolutely love carnaby street for the 60's pop culture alone. Good to see it's still thriving. It's such a Christmas-sy photo despite not having a Christmas tree or lights. I can feel the chill in the air. Great photo.